Every night, in the darkness above Toronto, satellites you’re not supposed to know about can be seen racing across the sky. The sun reflecting off of their antennae and mirrored surfaces reveals their existence to anyone who knows where to look. One man who knows exactly where to look is Ted Molczan, who, from the vantage point of his downtown apartment, has become one of the world’s foremost trackers of secret satellites. He has been on the cover of the New York Times, featured in Wired magazine, and is called upon by the media and government agencies to consult on matters of what’s in the sky. 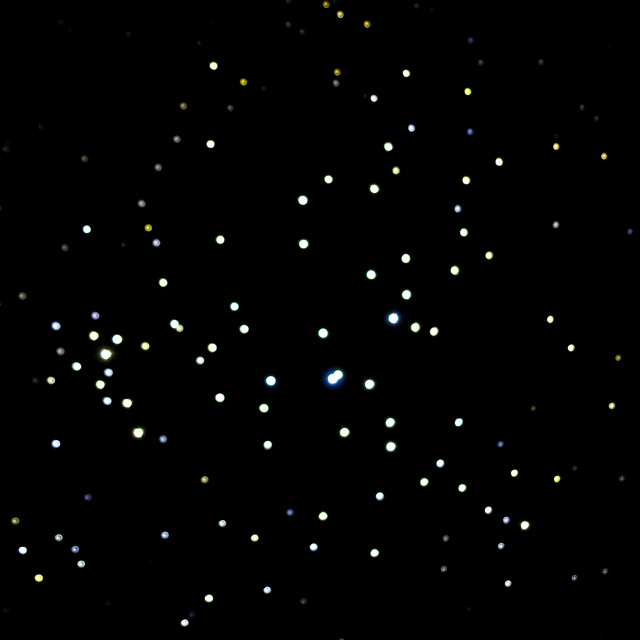 Molczan, along with a networked group of enthusiasts, tracks about 280 orbiting objects and makes approximately twenty thousand precise observations per year using tools as simple as binoculars, a stop watch, and basic star charts. On Thursday night, Molczan participated in a talk called “The Other Night Sky” at the Power Plant, in conjunction with their ongoing summer exhibition, “Universal Code.” (Watch for our review of the exhibit, coming later this week.) 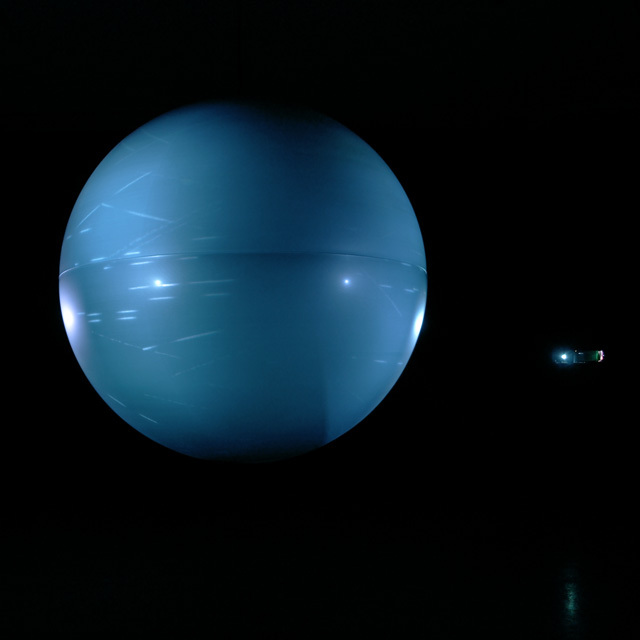 He was joined by Trevor Paglen, an artist-geographer taking part in the exhibition with a large-scale installation featuring moving satellite orbits projected onto a massive blue globe. Paglen is fascinated by the things that the American military doesn’t want us to see and the aesthetics of this secret world. He told the story of a covert satellite payload—code-named AFP-731—launched by the space shuttle Atlantis in February of 1990. About a month later, it was reported that this satellite had exploded in orbit and that the mission, whatever it had been, was a failure. This is where Molczan enters Paglen’s story, as he and his network of observers began reporting an object in the night sky following the orbit and flying at the altitude of the “lost” satellite. Further research revealed that a patent had been filed in the United States that same month for a satellite signature suppression shield. As word spread of the discovery that AFP-731 (or “Misty,” as it is known) was likely not destroyed and was still racing around the globe carrying out undisclosed tasks, the satellite soon vanished from Molczan’s night sky. Those in the community believe that the unwanted attention he brought upon this secret payload had Toronto added to the suppression shield’s target locations. A spectator looks through binoculars to the sky while Molczan (third from the right) consults sky charts outside The Power Plant. 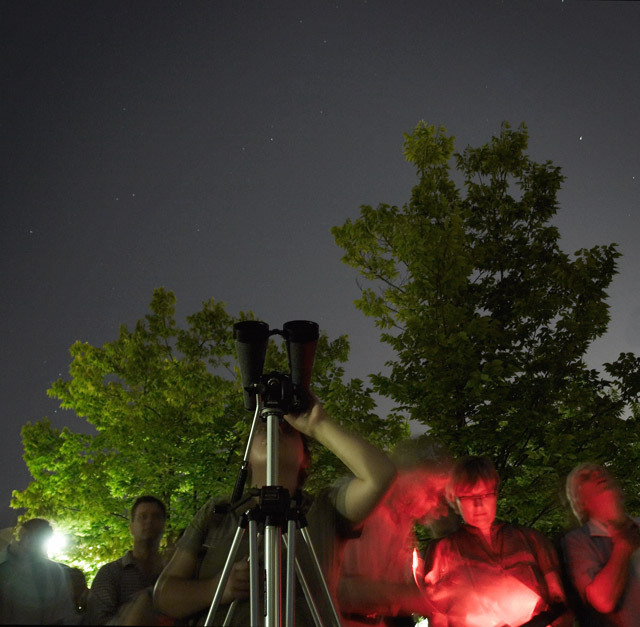 After the talk, Paglen and Molczan took the audience outside for a guided tour of the objects in orbit overhead. With impressive laser lights that reach way up into the night, they were able to point out with incredible accuracy just where and when these racing bits of light would appear. In the space of about fifteen minutes we saw various bits of classified space junk, a Russian weather rocket, a set of twin satellites that detect radio-waves from ships at sea, and, most excitingly, KH-11—a covert surveillance satellite about the size of a city bus, which raced across the sky over Toronto at 10:13 p.m. What is called a “keyhole” satellite (because it looks back down on earth rather than out into space), KH-11 is believed to have camera resolution high enough to discern objects as small as ten centimetres. It was tempting to smile and wave. “Universal Code” runs until August 30.